This week’s Statistically Speaking is less math and more heatmap interpretation. 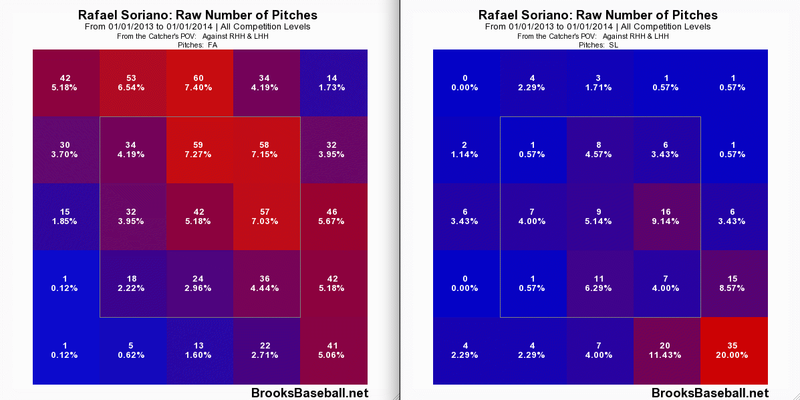 Sometimes, a picture can tell us more than a swarm of tabled numbers could ever start to, and for Rafael Soriano and his approach, it’s something that needs to be seen to be fully appreciated. 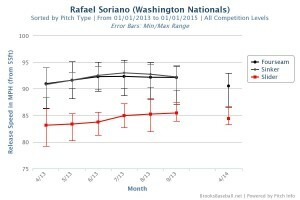 Tracking back to a previous Statistically Speaking article on the declines in velocity seen in some Washington Nationals pitchers, Soriano would been included, had he met the innings pitched criteria; however, the above picture tells us all we need to know about the fading heat from the Nats closer. 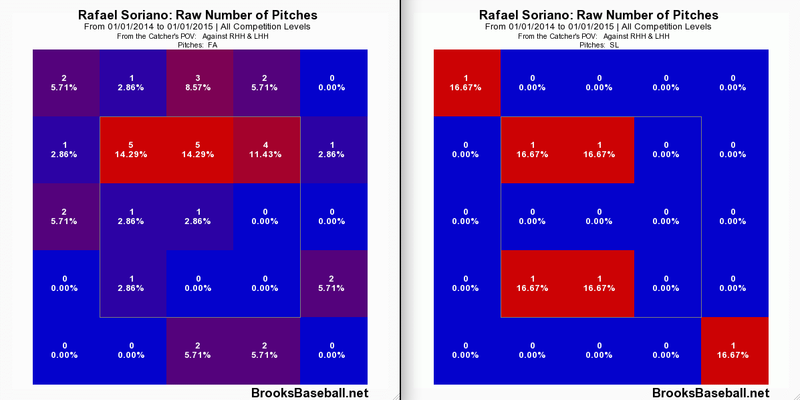 What we can gather from these heatmaps is that Soriano’s approach with the fastball really hasn’t changed—he still uses it up in the zone, using the late cutting action to bore into lefty hitters and to dart away from righties enough to prevent them from making solid contact with the pitch, or missing altogether, as the whiffs attest. He then uses the slider down in the zone as a way to change the hitter’s eye level and keep them against the high fastball, preventing them from sitting on the high fastball. 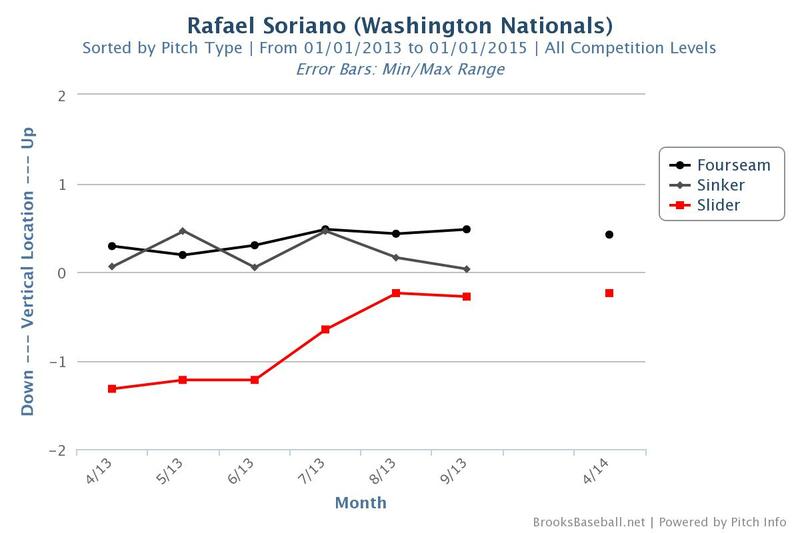 It’s a precarious approach, but one that has served Soriano well over his career. 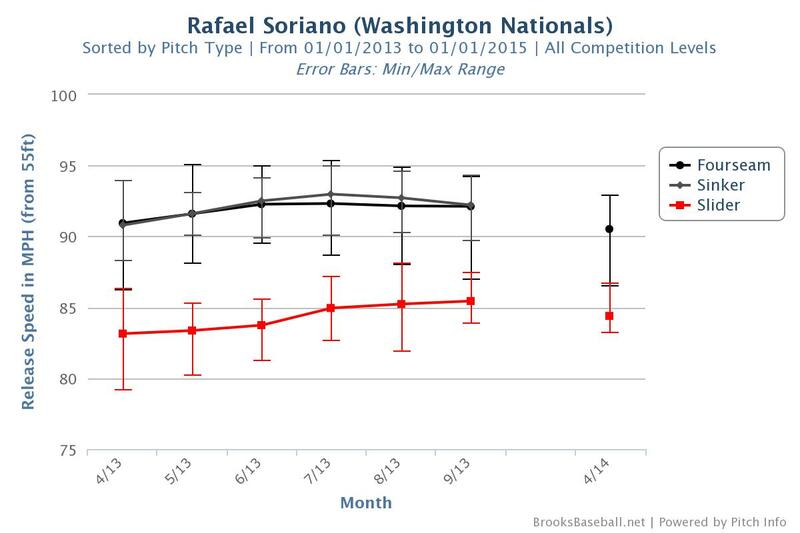 Yet, we do see the slider creeping up in the zone in 2014, which, thus far, hasn’t hurt him; also to note is the success Soriano has had with the slider in the past with respect to getting hitters to swing and miss with the pitch down in the zone. Comparing the creeping location of the slider in 2014 to the whiff rates of the pitch in 2013 and we find that it isn’t as effective a pitch in terms of missing bats up in the zone. Include the decreasing velocity and velocity differences on the pitch in comparison to the fastball and we come to a dangerous convergence—more pitches up in the zone at a reduced velocity meeting a reduced potential to miss bats or at least generate poor contact by way of a disparity in velocity. 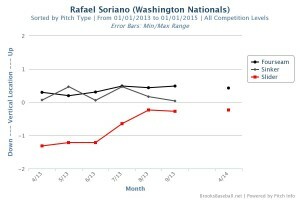 So far, Soriano has remained unscathed this season by the ominous trends; however, if his high-wire act is to remain an effective one for him and the Nats winning fortunes, Soriano should defy tightrope walking convention and start looking down.